The countdown for the first appointment of VMCevents 2017 has officially begun and thanks to the huge number of participants, it is already sold out. In a month the Garmin Venice Night Trail will be the only opportunity for 3000 runner to run in a magical and unusual atmosphere: a breathtaking 16 km race course in the historic center of Venice, up and down over 51 bridges! Nowadays Venice has more than 400 bridges (300 made of stone, 60 of iron and 57 of wood) built to connect the different areas which originally were reachable by the inhabitants only by boats. Moreover, until the XVI Century the bridges had no steps, in order to allow the passage of the carriages and their horses. The first bridge you will run on is the last one built in Venice: it’s Ponte della Costituzione, commonly called “Calatrava” Bridge in reference to the Spanish architect who projected it. The bridge was opened on 11th September 2008 just at night, it links Piazzale Roma to the Saint Lucia Train Station and it is one of the four bridges which cross the Grand Canal, the main waterway of the city. Running next to the train station you will notice Ponte degli Scalzi (which takes its name from the order of the Carmelitani Scalzi which for centuries officiated the Mass in the near church). Along the Cannaregio district, you will see one of the only two bridges in the city which don’t have parapets in Rio di San Felice (near the Scuola Grande della Misericordia), so be careful to avoid falling into the water! Later you will pass in Fondamenta Nove, whence you will admire some of the many islands of the North Lagoon: at night the most visible islands are the nearby Murano and San Michele (the Venice cemetery). Passing the Sestiere di Castello, you will cross the famous Ponte dell’Arsenale: from here you will see the place where the merchant ships and warships were built during the Venetian Republic. 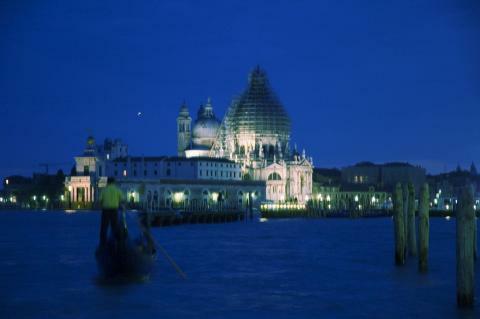 The course continues till the San Pietro di Castello island, linked to Venice from only two decks. In few kilometers you will see the South front of the Lagoon and you will be ready to face the long bank that will take you to the heart of Venice crossing eight bridges, including the Ponte della Paglia, whose name comes from the boats full of straw (used to change the mattresses of prisoners) and Ponte dei Sospiri, which connects the Palazzo Ducale to the Prigioni Nove. According to legend, the defendants which were convicted, crossed the bridge to be conducted to the prisons and from this bridge they sighted turning the last look to Venice as free citizens. 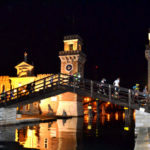 Once you will cross this bridge, you will still have few kilometers to reach the finish line but meanwhile you will be finally arrived in Piazza San Marco, even more beautiful at night. 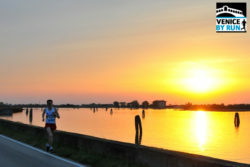 From the heart of the Sestiere di San Marco, you will return to Sestiere di Dorsoduro crossing the Ponte dell’Accademia, in front of the famous Gallerie dell’Accademia, whence you can admire the suggestive landscape along the Grand Canal till Punta della Dogana, one of the next stage of your race. Right here it is a tradition to build a temporary floating bridge during the Venicemarathon, which allows runners to reach the St. Mark’s area, just before you get to the finish line. Step by step you will arrive to the end of this nocturnal adventure, crossing the canals, up and down on 51 bridges, each one with a story, full of charm and mystery.